The author is required to add line number to the manuscript. Only articles in English are accepted for publication. Once the manuscript is submitted, the author commits himself/herself to fill in an Author(s) Statement (applies only to research articles) available on the System. The author is responsible for the contents included in the above named statement form. The submitted manuscript is subject to a preliminary linguistic assessment by a linguistic editor (native speaker) who cooperates with the Journal. Materials for publication are also evaluated by a statistical editor so as to verify the accuracy of the statistical methods which have been used in the article. In case of the necessity of making any corrections, the article is sent back to the author for proofreading. The accepted manuscript is subject to peer-review. In order to accept a manuscript for publication, the article should obtain a favorable opinion of two independent peer-reviewers. In case of one negative opinion, the Editor selects a third reviewer so as to obtain opinion. The content of a review is sent to the Author(s) asking them to respond to the reviewer’s comments introducing the suggested modifications. The revised material should be sent back to the Editor within 15 days of receiving the opinion of the peer-reviewer. The final decision of including an article to the issue of the Journal is undertaken by the Editor-in-Chief. The accepted articles for publication are subject to editorial and linguistic revision as well as adjustment in collaboration with the Author(s). The final version of an article after text makeup is sent to the Author(s) in order to carry out the author’s proof. The Author(s) having obtained a favorable opinion of the peer-reviewers are obliged to fill in a Copyright Transfer Statement to the Editor as well as the author’s Proof available on the System. Once the Editorial Board receives the author’s proof and relevant statements/declarations, the given article is submitted for printing. Assigned articles and non-scientific texts do not require to be reviewed and are qualified for printing directly by the Editor-in-Chief. Authors do not receive fees for publications. Publication of an article is also for free. The length of the manuscript should not exceed 7500 words (including appendixes, but not references, figure captions) or 26 double-spaced pages. All manuscripts should be submitted electronically. The whole document (including tables, references and list of figure caption) should be set using double-spaced lines, a wide margin, and all pages should be numbered. The chosen font should be no smaller than 12 points and line spacing should be no more than 3 * 2,5 cm. Abstract. A concise (200-300 words) abstract is required at the beginning of each article and, at the discretion of the chief editors, at the beginning of appropriate shorter contributions. Authors should summarize their conclusions and methods in the abstract. First person construction should not be used in the abstract, and references should be omitted because they are not available per se to abstracting services. Key words (3-10) which firmly determine the main theme of the article. Information on grants and funding of the research presented in the paper. Appendixes. Additional analyses or tables whose details are subordinate to the main theme of the article should normally appear in an appendix. Each appendix should have a title. References. References should be arranged alphabetically without numbering. 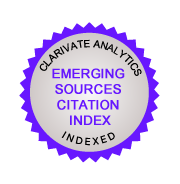 The text citation should consist of the author's name and year of publication. When there are two or more papers by the same author in the same year, the distinguishing suffix (a, b etc.) should be added. More information on preparing and arranging references is provided in section 3 of this document. Figure captions. Each figure must be provided with an adequate caption. A list of figure captions should be double-spaced. Authors must also include single-spaced captions directly on the figures. Illustrations and tables. Each figure and table must be cited specifically in the text and in numerical order. Authors should label figure panels with lowercase lettering, preferably in the upper-left corner within the figure panel. All tables should have a double-spaced caption, and table text and headers also should be double spaced. Figures and tables, including those appearing in appendixes, should be placed at the end of the manuscript file, after the figure captions list. All figures printed in the journal are placed on the typeset page as an electronic image file. The highest quality of reproduction is possible if authors supply electronic files of any images which were originally created in an electronic form. Accepted formats of figures are as follows TIFF, EPS, PDF, AI, PSD, FH, JPEG, PPT, DOC, DOCX, XLS. Authors should do their best to submit their figures at the size they will appear, with the understanding that the technical editors may resize the figures for layout purposes. Files should contain only a single figure and should not contain captions. Multiple-panel figures should be combined into a single electronic file in order to avoid additional handling charges. The printing of color figures in the journal is an expense that is passed on to Authors. Files with figures for printing may but do not have to embed captions. All signs and symbols should be built into the figure so as to avoid mistakes in translation. Graphics files of high quality may be submitted as supporting files at the same time as the manuscript or they may be attached later after the acceptance of the paper. Filenames for printing should include a numbering of the figures. The seize of figures should be close to the ones which will be eventually published. Panel letters should be placed close to the upper left corner or within the illustration so that they will not reduce the details placed on the illustration. As an alternative to panel letters on illustrations, descriptive wording such as upper (lower), left (right), top, middle, or bottom may be used in text and figure captions. Uppercase lettering and numbers for coordinate labeling and graphic symbols used within illustrations should be at least 1.5 mm after seize reduction, and for internal labeling, at least 1 mm. Line thickness should be at least ½ point or 0.1 mm after to journal seize. Colour images should be saved in CMYK mode not RGB. Converting RGB to CMYK is possible but there will be a compression of colour range. To ensure usability of your files, please try to achieve a resolution of 300 dpi for grayscale and color figures and 1200 dpi for line drawings. Nonessential information, internal grid and redundant headers which appear in the figure caption should be omitted from the graphic illustration. Figure captions in the text must be in numerical sequence. Authors should attempt to visualize mathematical expressions in the from as they are to appear in print. It is suggested to avoid built-up fractions and other complicated equation structures in text. This type of formulas should be displayed as equations centered on their own line. Consequently, the displayed equations are numbered consecutively to the numbering applied in the text. The equation number in parenthesis is set flush right. Due to AMS typesetting requirements, authors who use Microsoft Word to prepare their manuscript are asked to use MathType to prepare their display equations. Authors can facilitate the correct typesetting of their equations by using the correct typeface for variables. Scalar variables are set as italic, vectors are set as boldface Roman, and matrices and tensors are set as boldface Sans Serif. Parameters used as subscripts or superscripts are set italic unless they are an acronym or abbreviation, then we use a standard font. Units should be SI with the exception of a few approved non-SI units of wide meteorological or oceanographic usage. Units should be set in Roman font using exponents rather than the solidus (/) and with a space between each unit in a compound set (e.g., m s-1 rather than m/s or ms-1). Day, month, and year are written in the form “26 May 1998” . Do not abbreviate the names of months except in figure captions or tables. The recommended time zone annotation system is universal time and is abbreviated UTC. Time, time zone, day, month, and year are written in the form “1619 UTC 26 May 1998.” The use of other time zones is permissible—for instance, EST, EDT, PST, LST or LT. Do not use Z or GMT in place of UTC. Astronomical or military time (i.e., a 24-hour clock) is required. Reference must consist of last name and initials of author(s), year of publication of journal, title of paper, title of journal, volume of journal, number of issue, first and last page numbers of the paper, DOI number if assigned. Reference must consist of last name and initials of author(s), year of publication of book, title of book, publisher’s name and total pages., DOI number if assigned. For example: Wallace J.M., Hobbs P.V., 1977, Atmospheric Science: An Introductory Survey, Academic Press, 350 pp. For a book or monograph which is a collection of papers written by independent authors, the reference must be made to the authors of a particular chapter and consist of last name and initials of author(s), year of publication of book, title of the chapter, title of book, name of editor(s), publisher’s name, and inclusive pages for the chapter, DOI number if assigned. The format is similar but includes the volume and number of the monograph. Reference must consist of last name and initials of author(s); year of publication; title of paper; indication of the publication as a preprints, proceedings, or extended abstracts volume; name of conference volume; city and state where conference was held; conference sponsor’s name; and pages of the paper. References should be given to peer-reviewed literature whenever possible. Technical reports, conference proceedings, and other “gray literature” should be referenced only when no other source of the material is available. If two or more papers by the same author also have the same year, a distinguishing letter is added after the year. If references have the same year but the second author differs, order alphabetically by second author. Author(s), publication year, book title, publisher, total pages, and/or DOI. Oke T.R., 1979, Boundary Layer Climates, John Wiley and Sons, 372 pp. Author(s), publication year, title, edition number, publisher, total pages, and/or DOI. Chorin A.J., Marsden J.E., 1993, A Mathematical Introduction to Fluid Dynamics, 3rd edition, Springer-Verlag, 169 pp. Author(s), publication year, chapter title, book title, editor(s), publisher, page range, and/or DOI. Author(s), publication year, title of complete work, volume number, publisher, total pages, and/or DOI. Courant R., Hilbert D., 1953, Methods of Mathematical Physics, 1, Wiley-Interscience, 560 pp. Author(s), publication year, title of complete work, volume title, volume number, publisher, total pages, and/or DOI. Petterssen S., 1956, Weather Analysis and Forecasting, Motion and Motion Systems, vol. 2, McGraw-Hill, 428 pp. Author(s), publication year, chapter title, volume title, editor(s), volume number, title of complete work, Publisher, page range. Author(s), publication year, title, title of series, volume number, publisher, total pages, and/or DOI. Andrews D.G., Holton J.R., Leovy C.B., 1987, Middle Atmosphere Dynamics, International Geophysical Series, 40, Academic Press, 489 pp. Author, year, chapter title, volume title, editor(s), series title, volume, publisher, page range, and/or DOI. Author(s), publication year, article title, monograph title, monograph name, monograph number, publisher, page range, and/or DOI. Seidov D., Haupt B.J., Maslin M. (eds. ), 2001, The Oceans and Rapid Climate Change: Past, Present and Future, Geophysical Monographs, 126, American Geophysical Union, 294 pp. Author(s), publication year, report/note/memo title, report/note/memo name and number, total pages, and/or URL. Optional: publishing institution and city and state/country; NTIS number; address from which report/note/memo can be obtained, address from which online version is available. Author(s), publication year, dissertation/thesis title, university, total pages, address from which online version is available. Optional: Address from which the dissertation/thesis is available. Hirschberg P., 1988, The saline flow into the Atlantic, M.S. thesis, Department of Oceanographic Studies, The Pennsylvania State University, 207 pp. Cheng X., 1993, Linear and nonlinear aspects of Northern Hemisphere wintertime variability in the 500 mb height field, Ph.D. dissertation, University of Washington, 180 pp. Author(s), publication year, article title, conference title, volume or report number (if included), city where the meeting was held, sponsor, page range or paper number. Optional: address from which online version is available. Author(s), publication year, atlas title, publisher, total pages. Optional: map title, folio number(s), plate number(s), number of microfiche. Bumpus D.F., Lauzier L.M., 1965, Surface circulation on the continental shelf off eastern North America between Newfoundland and Florida, [in:] Serial Atlas of the Marine Environment, American Geographical Society, Folio 7, Plate 8, 4 pp. Software: author(s)/authoring group, year, software edition or version, company/organization which holds the rights to the software. CD-ROM: author(s), year: section/article title, CD-ROM title, volume number, publisher/rights Holder, CD-ROM disk number. Newspaper articles frequently are mentioned only parenthetically in the running text. However, if there is a complete reference, then it should be retained in the reference section. The term digital media refers to the distribution medium by use of which data from different datasets are distributed to their users (e.g. NSIDC’s in the USA). Most of the datasets can be distributed in several media types such as FTP, CD-ROM, DVD, and DLT. A personal communication is a completed manuscript which was never published, or an informal discussion, or written communication with researchers. Include initial(s) and year. Distinguishing letters: If a citation includes sources by the same author, published in the same year, distinguishing letters from references (a, b, c, etc.) are used, separated by a comma but no space. Page range: If a page range is cited, it should follow the year, preceded by a comma. No “pp.” is needed. Submitted references: Within the citation, make sure to add “manuscript submitted to” and the journal name in italics. (O’Bannon 2001, manuscript submitted to Water Resources Research). Abstracts: Note that we do not allow citations in the abstract. Double–blind reviewing is a model of cooperation which ensures anonymity for both authors and reviewers. Publisher will strive to avoid any conflict of interests between Reviewers and Author(s). Ghostwriting denotes a situation when someone has made a substantial contribution to the development of an article and has not disclosed his/her work as one of the authors or has not been mentioned in the acknowledgements embedded in the publication. Guest authorship denotes a situation when the contribution of an author in the process of the development of an article was negligible or it had not taken place and yet he/she is the author or co-author of a given publication. In order to meet the highest editorial standards and to counteract phenomena described in paragraph 2 and 3, the Publisher puts the responsibility on the Corresponding Author to sign Article Submission Form in which he/she indicates persons who took part in the development of the article presenting their affiliation and contribution specifying its percentage. All detected cases of ghostwriting and guest authorship will be exposed including notification of relevant institutions namely institutions employing the authors, scientific societies, associations of scientific editors. Author(s) of publications has/have the duty to inform the Publisher about the source of financing namely the contribution of research and development institutions, associations and other entities (for instance: once the outcomes presented in an article result from a grant/financial support/ project financing contract, the author is obliged to inform the Publisher about it). Publisher informs that all works (manuscript, figures, tables, photographs and other illustrative material) published in Meteorology Hydrology and Water Management – Research and Operational Applications, both in print and online, become the property of the Institute of Meteorology and Water Management PIB. Each Author / Co-author is obliged to sign an agreement transferring the full and exclusive author’s economic rights to the Publisher. This means that the author does not have rights to publish the article in another Publisher.